Easter Egg Lunch Hunt - A fun activity and lunch for kids! Make your kids’ lunch into an Easter Egg Lunch Hunt! They’ll have a blast opening each egg to see what surprise awaits them! Lunchtime has never been so fun! Scroll to the end for a fun Easter egg lunch idea for older kids! 8 years ago, Kaylee and I decided to do something a little different with lunch! We filled Easter eggs with all sorts of lunch items. Bite-sized lunch items for a fun Easter egg hunt. Even little peanut butter & honey sandwiches. It has become one of our favorite activities and we also go on Easter egg lunch hunts (or snack hunts!) when friends come over. This will be our 2-year old’s first year to participate. He is the perfect age to catch on quickly and have fun with this Easter egg lunch hunt. Scroll to the end to see what we do for our older 4 kids who are all in school now! This is the most popular Easter post on Gluesticks and for good reason. It’s SO EASY and SO FUN and honestly, the quickest way to skyrocket yourself to “best mom ever” status for the 5 and under crowd, ha! What food items can you use for this Easter egg lunch hunt? Grapes, raisins, nuts, goldfish crackers, cheese cubes, mini sandwiches, and dry cereal are some of our favorite things to put inside of the eggs. How do you split the Easter eggs evenly amongst groups of kids? I like marking the eggs when multiple children are going to be hunting for lunch, that way everyone has a well-rounded collection at the end. The unmarked eggs were Aaron’s and the marked eggs were Kaylee’s. At the end of the egg hunt, they exchanged eggs. We’ve had just as many Easter egg lunch hunts indoors as we have outdoors. It just depends on the weather. Make sure to find all of those eggs so that the food doesn’t go bad! For our first hunt 8 years ago, Kaylee ran right up to the bus when Aaron got home from kindergarten, handed him a basket, and they hit the grass running looking for their lunch. He was totally game for having to search for his lunch! After the Easter eggs were found, the sorting began. Here’s another fun Easter egg lunch idea! I filled Dallin’s lunch box with Easter eggs as a fun “last day before Spring Break” lunch. He loved it and was very surprised when he opened his lunch box. He said that when he saw them he said, “What the heck?!?!?! ?” and all of the kids in his 2nd-grade class came over to see. They thought it was “SO FUNNY! !” and liked watching him open each and every egg to see what lunch item was inside. Score! It’s been 7 years since we started this tradition and the kids think it is hilarious—my boys not as much now that they are in middle and high school, but they are good sports, haha! Here are a couple more Easter ideas for kids! Easter Bunny Luncheon for Kids. We’ve also got a great Make an Easter Bunny Cake you can make as well! Try some of these spring activities for even more fun! What a great idea! Looks like your kiddos loved it! This is a must do for me now. Thank you! What a great idea! I’m going to have to try this! SUCH a cute idea, so doing with my niece when she’s older! Very creative! I think this would also be a fun treat for a child that takes a lunch or treat to school…so much more fun to find a bunch of brightly colored eggs than a couple of plastic baggies. I absolutely love this idea, and I want to do it. Thanks so much for sharing it. Very clever. Oh!! How clever and such a fun idea! My kids would love this! I may try it out! If I had little ones at home, I would be doing this for sure. What a fun idea. I’m sure your kids had a blast. This is the BEST idea!!! My girls are going to be all over this one. Thank you so much! Sometimes, the meal preparation is such a drag over and over and over again. I’m sure the kids feel the same – this ought to liven things up. LOVE this, so fun! Definitely going to try it with my daughter. Such a cute idea:) Thanks for sharing!!! Just found your blog and became your newest follower. This is such an AWESOME idea!! I am in love with it. 😀 Brilliant. This is such an amazing idea! Way to add some fun to lunchtime! What a terrific idea! Thanks for sharing! What a great idea! We actually shared in on Family Sponge today— thank you for the inspiration! Look forward to reading your blog more. Oh my gosh… I am TOTALLY going to pack my daughter’s lunch like this on the last day before Easter! IN LOVE! I will definetly try this with my two little girls! They will love the novelty and enjoy all the tiney foods!! Oh wow! What an awesome memory for your little ones! I am SO excited and am going to try this with my three year and 11 month olds! My toddler doesn’t want to eat anythinnnnnnng at the moment so maybe this will do the trick and be fun at the same time? Pinning this idea. Would love if you would link it up too on my party going on now at Teagan’s Travels! Brilliant. Totally pinning this asap. What a fun idea. THANKS for the lunch-in-egg idea! I used it for my daughter’s lunch at preschool! Thanks so much for the idea!! Did this for my 1st grader and Kindergardener’s lunches today and sent them to school with the egg carton as their lunch box. they LOVED it!! So much that I had to do a half-carton for my preschooler to take for her snack. Yay!! Super-mom!! So awesome to heaar KDodson!! How fun! And kuddos to you for preparing that 3x! This is simply brilliant! Thank you for the idea! It’s nice to fill easter eggs with something besides candy. We usually have lunch/dinner around 3 with the in-laws on Easter Sunday. That’s tough for a 7 year old. If I feed him lunch, he isn’t hungry at 3. But it is too long for him to wait to eat. I am going to use this idea (found you on Pinterest, btw) and put mostly fruits with a couple of small protein items so that it will tide him over until we have our main meal. So I did end up doing this, and my kids had a blast! They thought it was so much fun and enjoyed all the surprises in the eggs (we had cheese sandwiches, grapes, banana, tiny teddies, savoury crackers and ham). A moment that every kids will cherished. Just a thought. You might want to check and see if the plastic eggs are food safe. Sometimes you never really know what is being put in the plastics that might leach into food. Saw this on Pinterest earlier this year and did it for my kids’ lunch at school. They loved it! Thanks for the great idea. You are welcome! I can’t wait to do it again! Thanks for the fun idea! My daughter’s birthday is in April so last spring I filled up the eggs for their lunch. It was fun to see how they all ate them differently. Some ate one egg at a time, some emptied them all out at once. Hi, good idea thanks for sharing. Love this idea. . . . i clicked through a pin on pinterest, but it came up as a suspicious link and I had to bypass that to get here. Just FYI. Can’t wait to surprise my girl with this in her lunchbox on Friday! This one caught my eye right away. Love it. Thanks Glenda! It was so much fun! Such a fun mom! I have to do this! Love it. Linking back to my blog. Darling. Thank you so much, Tisha! 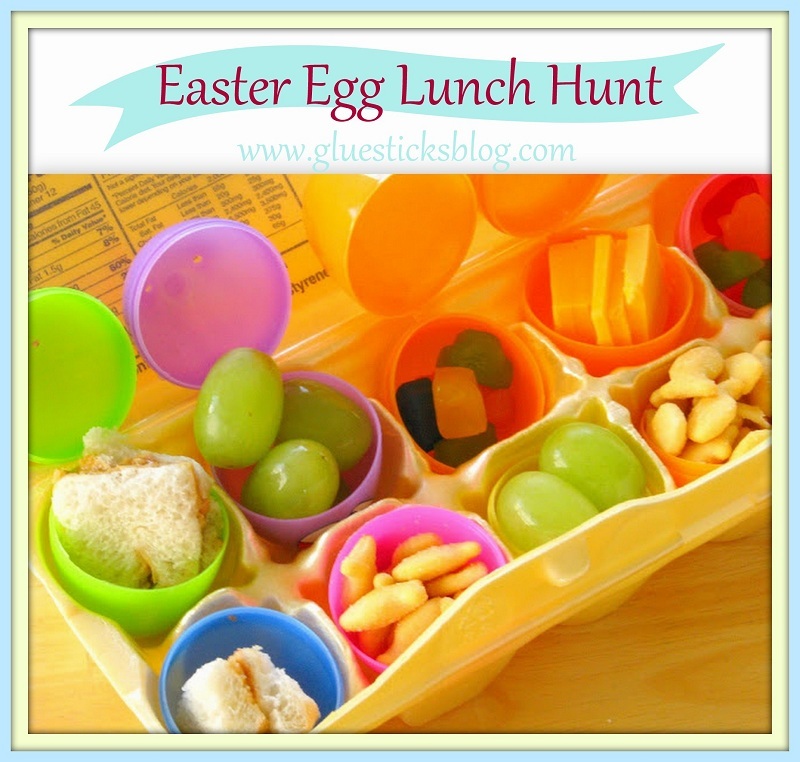 I love, LOVE your Easter Egg Hunt lunch idea – so fun! The bunny donut cups are adorable too! Great Post!